SCRAPiVERSE: Christmas Cards! More Christmas Cards! it's Thursday! I love coming into work on Thursday mornings- not only because I know that tomorrow is Friday, but because I love walking past the receptionist, Miss Cathy, who always shouts, "IT'S FRIDAY EVE!" Not that I have a weekend- I'm working all the time, ladies and gentlemen. *of course, by popular, I mean people I must send cards to because I've offended them in one way or another. Up first: Another card using my beloved Tim Holtz retro-Santa stamp. Remember how I was whining about how I've had trouble coming up with ways to use him, as the stamp is so gloriously large? Well! It occured to me- WHY do I think I have to use the entire image?! I went home for lunch yesterday- another perk of living four blocks from work- and made this card. 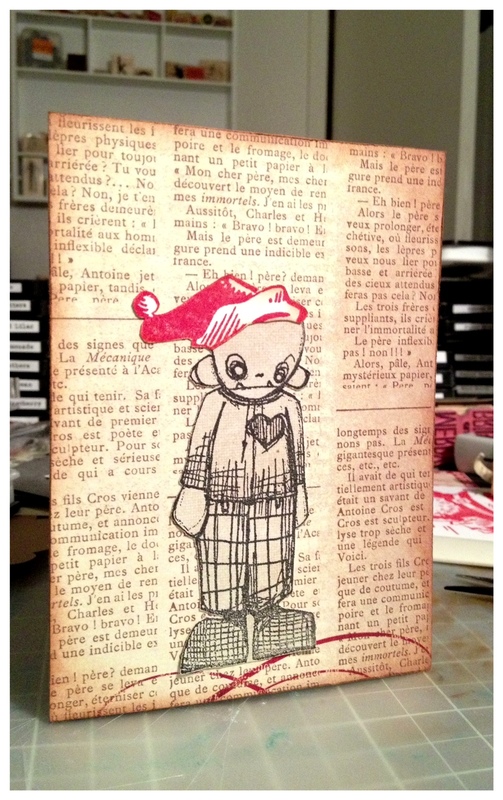 I just pressed half of him on my big ink pad and stamped him on a scrap from another card. Look at that surprise I got when I lifted the stamp from the paper! Because I never clean my stamps and Distress Ink takes forever and a day to dry, some Festive Berries remained on the stamp from the previous day- and it created a nice subtle effect of the black fading into the red fading into the paper. I've got to come up with a technique to replicate this or Google for the genius who already has! 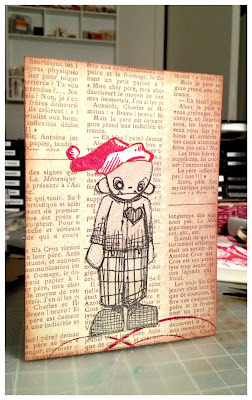 I tore the top of my stamped piece of paper and added two strips of (My Mind's Eye: All Is Bright) washi tape. 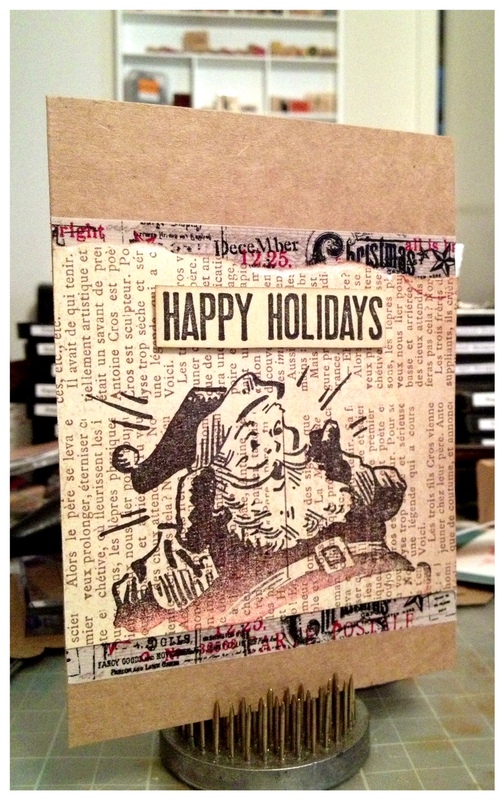 I stamped the sentiment and pop-dotted it on and THIS IS MY SECOND FAVORITE CARD! I love Daniel Torrente's stamps from Stampotique. Some people just say they're scary and think they're only for Halloween or deranged people. I think they're strangely sweet and adorable. So to turn him from Halloween to Christmas, I cut the hat from Mr. Holtz's Santa and gave it to this little guy. Another very simple card. I die cut one of Mr. Holtz's 'Carved Ornaments' from silver glitter paper (1.99 a sheet?! This ain't REAL silver, people!) and added a sentiment stamped from a dollar bin stamp. The kraft background is embossed with my favorite emobossing folder set EVER, "James' Set" from Cuttlebug. This is the card I made for my boss. I knew she'd like something different than the clean 'n simple cards that I prefer- so I did a few things on this one to bling it out a bit more while still keeping it classy. After embossing with that 'frame,' I rubbed an embossing ink on it and sprinkled some 'Pewter' embossing powder all over it- after heat embossing, I randomly sanded parts of the card then colored randomly around with two different colors of Distress Ink. I die cut the heart and rubbed Rock Candy Distress Stickles over it, punched out a silver snowflake and added a brad from the My Mind's Eye All Is Bright brad set- I think it's pretty lovely. 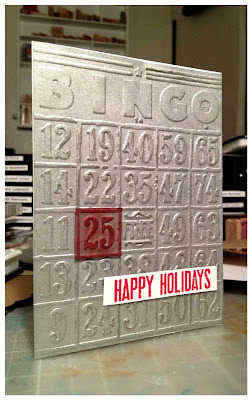 I got the idea to emboss two bingo cards- one for the base, one to cut the '25' out and pop-dot it over the '25' on the piece used for the card base. 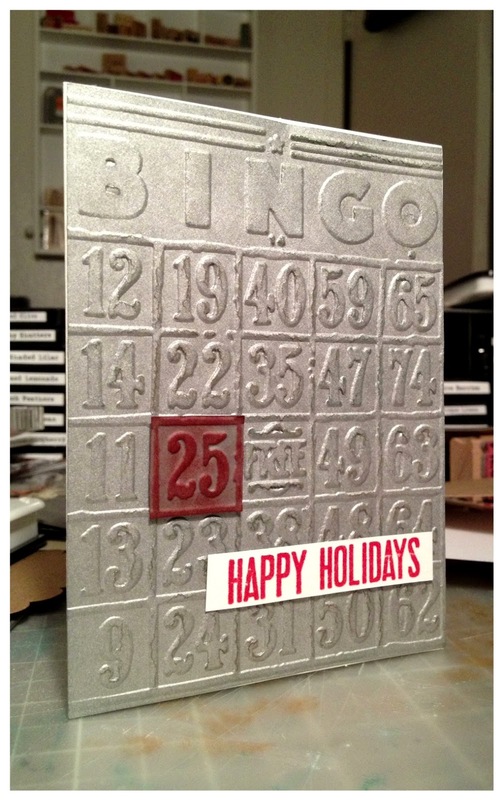 I liked the plain silvery base with only the red '25' and the red sentiment. I guess the previous card put me back into the embossing mood. I clipped out a piece of December calendar from a Jenni Bowlin paper I'd picked up somewhere and added a pointy-finger charm from Hobby Lobby. 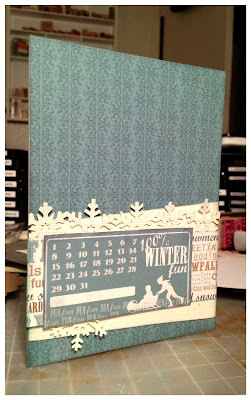 The sentiment is embossed with a new embossing powder called 'Silver Tinsel' that I picked up at Michaels. Whaaaaat? How'd that blue and white beat out the kraft and sneak its way onto a card?! I picked up a 6X6 Carta Bella Christmas paper pad at Basket Market for only 3.00 and, since I bought it, forced myself to try out a card with a color other than brown. It was tough. It hurt a little. But I like it and I'm a better person for it. And we're back to the simple kraft cards! But there's a little blue under the pennant-y shape and the dollar bin sentiment stamp. Alright- that's it for the cards- OH WAIT, no it's NOT! I love this card. I'm proud of this card. I used one of my most favorite stamps of all- I call it "The Classy Guys Stamp." It's really just another simple card- but all the pieces tricked me into thinking it's quite a work of art. ;-) IF you count five bits of cardstock as 'lots o' pieces.' But I made this to be my version of the 'Perfect Gentleman's Christmas Card.' Which then inspired me to try to make more 'manly cards.' This evening. That's my challenge and goal for what looks like it'll be a cold Thursday evening.. Make at least three clearly masculine Christmas cards. We'll see what happens! Enjoy the rest of your Thursday. I guess the world isn't going to end. Thank you, Mr. Paul! I've been missin you! Where you been?! All the cards are really great... I really like the santa card it just too cool for words. Hope you have a good rest of the week. You are a machine!! I need that kind of creative energy. I thought the one for your boss was my fave until I got to the bottom one. Now I'm conflicted. I love them all! The pewter ep on the boss card tho...so pretty with that folder. Is the technique for Santa. Rock and roll. Then wipe the edges of stamp with baby wipe before you stamp. I love your cards and was very inspired by the white collection. Merry christmas Kory. I do hope you get more than one present. Love the cards! Especially the bingo one. Great way to make that work for the season. TFS!